If you’re like me, or one of the other 44 million student loan borrowers, you’ve probably asked how do I refinance my student loans? 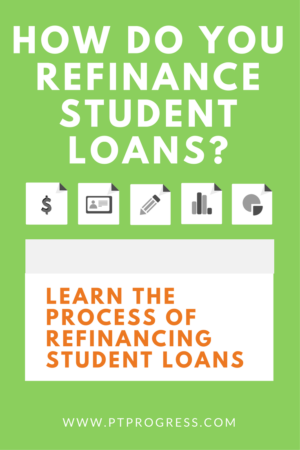 Unfortunately, most sites just recommend student loan refinancing companies and don’t really outline what’s involved in the process itself. This article actually tells you how to refinance student loans. I decided to dive headfirst and figure it out for myself, documenting the journey to answer the question: How Do You Refinance Student Loans? Step 1. Find your current student loan payoff statements. Step 2. Gather your financial documents: paystubs, rent, SSN, employer info, photo i.d. Step 3. Scan or download your college transcript or diploma. Step 4. Have Co-Signer personal info ready; you may also need a personal reference. Step 5. Start the first application with a reputable company (SoFi, Laurel Road, etc). Step 6. Get ready to be denied at first. Don’t worry, that’s common. Step 7. Add Co-Signer if needed. Have Co-Signer log in and verify their info and income. Step 8. Wait about 24-72 hours for approval or denial. I also decided to add a cosigner to the application. This will make the process longer because the cosigner will have to log in, put their income and personal information into the website and submit the application. If you’re fortunate to have a spouse who can co-sign, that will save you some time and headache. Part 2: Student Loan Refinance Approved! You’re approved! Now it’s time to choose your lender and your terms. Most borrowers are attracted to a lower interest rate, but that shouldn’t guide your decision 100%. It may also be important for you to have flexibility with the term or length of the loan. My advice is to use a student loan calculator to figure out the monthly payment and terms that best fit into your budget or goal for paying off the loan. A good student loan calculator can show you the interest you will pay over the life of the loan and how extra payments can help you to pay it down faster. What if I don’t qualify for student loan refinancing? Sometimes a lender will reject your application if your debt to income ratio is too high. If you have outstanding credit card balances or auto loans, consider paying these off as quick as possible to lower your debt to income ratio. Freeing up a few hundred dollars a month in a payment might be all you need for approval the next time you apply. How much does it cost to refinance student loans? According to the Higher Education Opportunity Act of 2008, private lenders are not allowed to charge consolidation fees or prepayment penalties on refinanced loans. Can you refinance a private student loan? Yes, these loans generally have higher interest rates so they are great loans to consolidate and refinance. Can you consolidate a Subsidized and Unsubsidized student loan? Yes, you can consolidate these types of federal loans with a private student loan refinance company, but you may not be eligible for the income based repayment options once you refinance with a private lender.